Hendaye is the furthest point in the South West of France that you can go to: a frontier town with Spain and confined on the edge of both the Atlantic Ocean and Pyrenees Mountains. Hendaye is a sprawling town, split into 2 main areas and separated by 2 kms. The old medieval Basque Town is situated on a hill top and commands good views of the Bay of Chingoudy and the river Bidassoa estuary below to the North & West, with the impressive scenery of the foot hills of the Pyrenees Mountains to the West, South & East. Here in the town is where you find most of the shops, the Mairie, Pelote Basque etc. The beach area is located on a peninsula formed by the Atlantic and the beach to the North and the bay and river to the South & West. 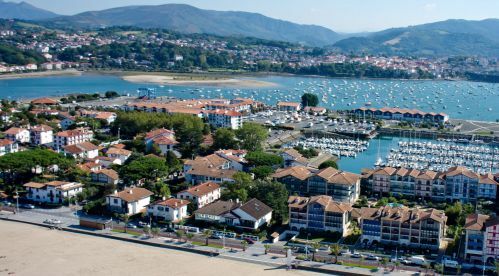 This part of Hendaye is relatively modern and it is here that you will find the Marina (on the bay side), Hotels, Casino and the Serge Blanco Thalasso Center (Serge is one the best former French International Rugby team Players). The large bay provides good sheltered facilities for water sports, wind surfing etc. at the Club Nautique and all types of facilities for boats, while the Atlantic beach has some excellent surf. Hendaye as stated above is a border town, with easy access to Spain and the cheaper shopping in Irun, Fonterrabia (a ferry boat crosses the river on a regular service from Hendaye Marina to Fonterrabia) or Col d'Ibardin. Enjoy your visit to Hendaye !